I have 20 images available on personal checks, side tear checks, address labels, and checkbook covers . There are 4 rotating images in 5 different sets of designs: farm animals, rooster, floral, high heels, and painted figures. Please check out the bio also. Click on the longhorn for the Nancy Standlee Collection. 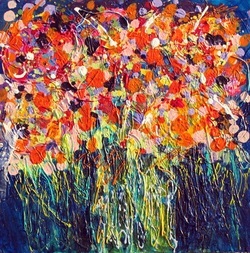 Click on the floral for the Nancy Standlee bio and image. 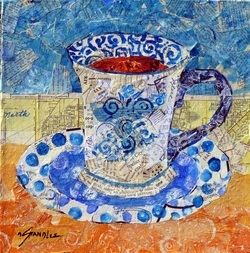 An affordable, online tutorial at Daily Paintworks about the collage process using this cup image as an example. I would appreciate a review if you purchase. The ArtByte has 10 pages and over 50 images. This is my shop on Etsy and the items will vary from week to week. Thanks for looking. Later there will be some small watercolors available.